how to change cam perspective (fov && angle)? developer has stated he uses a "fov" and camera perspective. is it possible to do this, with let's say hump's camera addon? We have a perspective camera, which is looking onto the ground under some angle (22.5 degrees on x axis worked well for us). FOV is 1.0177028. Defold is a 3D engine, Love2D is a 2D engine. If you want to do 3D-ish stuff like Smash Bash you're probably better off using an engine designed to support 3D. It is possible to do 3D in Love, but it's significantly more work than in something like Defold. I'm pretty sure you can achieve the same effect in love2d without " a lot of work"
Löve is a framework; what you accomplish with it is your business; it uses OpenGL, which is able to handle both 2D, 3D, or any Dimensions you want it to, be it 2.5 or 4. But yeah, the bigger issue is that for perspective projections (textures rendered correctly when "slanted"), you do need to use a separate shader, because that's not something you can just toggle. There are two things going on in that game: the ground is rendered on an inclined plane, and the vertical things are rendered standing straight up. Since he's in Defold, he's rendering things in proper 3D (using the depth buffer to determine which things are in front of which other things). But if you're never going to rotate the camera (he never does), the depth buffer is unnecessary. You can just write a vertex shader to give the perspective squashing to the ground, and then reset to the normal shader and draw the upright images (sorted from farthest away to nearest, which is easy if you're looking at it straight along one axis). In the ground vertex shader you'll want to transform the corners of the ground tiles from world to screen coordinates. If you're going to do mouse picking or anything you'll also need the inverse transform (screen to world). I did this recently for a game I'm working on. I think I can extract it fairly easily: I'll take a look tonight and try to post a quick demo. I'm pretty sure you can achieve the same effect in love2d without "a lot of work"
Yes, that's why I didn't say "a lot of work". But in Defold, where the rendering is all 3D by default (though the collision/physics is 2D) it's completely trivial: you probably don't have to write any code at all or use any special shaders or anything that isn't built into the engine. In LOVE you'll have to write or find a custom shader or library to deal with the 3D stuff. Depending on your skill level that may not be a problem, but it is, as I said, "significantly more work" than placing some objects and a built-in camera. Defold has its issues and quirks, and you may have other reasons for wanting to use (or continue to use Love). If you're happy to learn a bit of math and like to have total control over how things work, then Love is a better choice. If you just want to place a bunch of sprites and have them rendered in 3D, and you don't mind the workflow imposed by a visual editor, then there are other engines which will serve you much better. 3D coordinates and angles to love.graphics.draw, love.graphics.circle, etc. Edit: here you go. This doesn't handle scrolling the ground because that was more work and I couldn't be bothered. But it should get you started. -- Apply any translation/rotation etc. first. -- Undo the perspective transform first. -- Then undo any rotation/translation etc. Wow this piece of code is something great. which shows the the upright rectangles/sprites have a small transformation to them swell. I feel funny asking it, but my shader and 3d skills are quite subpar, could you show this shader too? I am trying to achieve it but failing miserably and hope you have it sort of at hand. edit: I am thinking and experimenting a bit more with this upright rectangles nd am thinking it would be easier and lighter to just fiddle with the vertex data directly, because you would need to know the dimensions of the upright rectangle to calculate its deformation (its not like the ground only depending on the screen width and height), but I might be missing something. the upright rectangles/sprites have a small transformation to them as well. could you show this shader too? Yeah, that's an actual 3D perspective view. The tops of the upright rectangles are bigger because they're closer to the camera. If you want to do that in a vertex shader, you need the full 3D coordinates of all the corners. Otherwise how do you know which ones are "on the ground" and which ones are up in the air? Any x/y position could be interpreted as some position on the ground, so the shader can't tell. 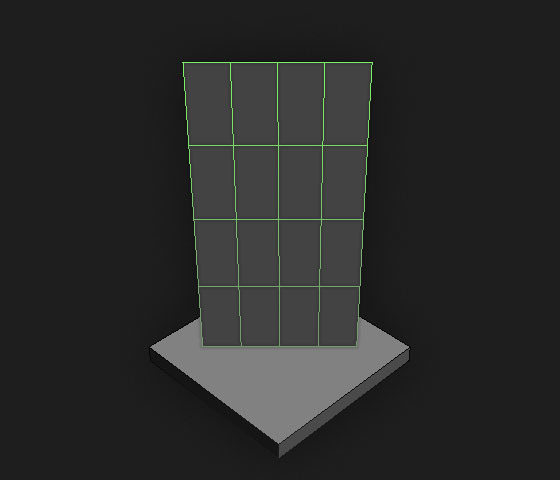 And if you want actual 3D then you definitely want to use proper matrix math and just use a perspective camera matrix. It will be easier than trying to work out just the part of the math that does what you want. Even for the extremely simplified version that I gave, it almost wasn't worth the time it took me to work out the specialized math. You might have a look at CPML for the matrix math? I haven't used it but it looks fine. Matrices actually aren't that scary: they're just a coordinate system, with a vector for each of the axes, and one to say where the origin is. They're just usually described with tons of jargon (I apologize for my fellow mathematicians who have done such a poor job explaining things). If you want, I can give you a quick intro to how it all works. But I'd just draw the upright rectangles without the deformation. It's probably not worth your time. And if you want 3D...as I said before, I'd use an engine designed for 3D. Obviously you can do it with LOVE, but it will take a significant amount of time to build the tools that you would have already available in something like Defold (which also uses Lua and works on most platforms). Do you want to spend your time making games, or do you want to spend your time working around the problems caused by using the wrong tool for the job? I'm not trying to sell you on Defold in general: I tried it and then came back to LOVE because it's more my style. But for learning 3D it'll be easier than trying to learn and build everything from scratch. And as much as I love LOVE, it's not yet (and maybe ever) an efficient or easy-to-use tool for making 3D games. That example I posted may look cool, and look very simple, but that's because it is a solution to a very carefully chosen and extremely limited problem, and it has tons of limitations. Trying to extend it to do fancier things is likely more trouble than it's worth.